Broadway, a metaphor for the city it runs through, has undergone many changes since Native Americans walked its path. The street is home to iconic public spaces, world-renowned cultural institutions, and an abundance of architecturally significant buildings along its 14-mile stretch. The street hosts world-renowned events for hundreds of thousands of people, houses fabric suppliers patronized by famous designers, is home to highly competitive academic institutions, and encourages shoppers to purchase anything they desire. Broadway also welcomes residents and visitors to sit comfortably on a bench surrounded by greenery in a space carved out of its wide berth. Begins in Lower Manhattan at Bowling Green and travels north for approximately 14 miles where it exits the borough at West 230th Street in Marble Hill. Broadway at 96th Street. Photo courtesy New York City Department of Transportation. Broadway is one of the oldest roadways in New York City. Parts of the street date back to pre-colonial times when the Weckquaesgeek Chief walked south from present-day Dobbs Ferry, New York. Near the end of the 19th century, Broadway was completed by connecting several separate road segments, including the original Native American footpath. From Columbus Circle to Union Square, Broadway runs on an east to west diagonal cutting across New York City's dominant street grid system. 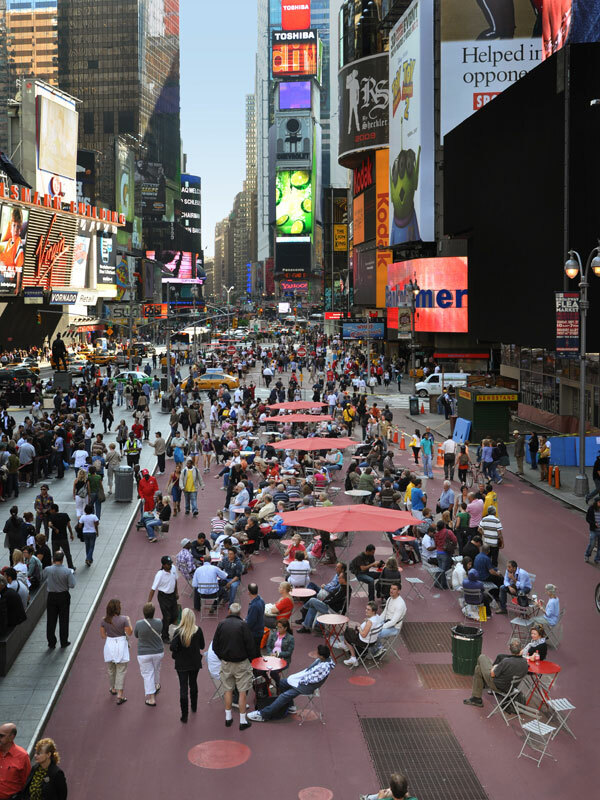 Where Broadway crosses an Avenue it creates a "square." These complicated crossings have plagued traffic planners and engineers since the inception of the grid system in 1811. In fact, the 1811 commissioners did not want Broadway to exist in its "un-gridlike" form and tried to straighten out the road above 14th Street. Fortunately, from a public space perspective, they were unsuccessful. Four of Broadway's best known squares — Union, Madison, Herald, and Times — have unique personalities, define neighborhoods, and remain centers of activity day and night. South of Union Square the roadway continues on a straight path directly to the southern tip of the island. North of Columbus Circle the road widens and converts to a boulevard up to 170th Street where it veers west and continues on into the Bronx. Improving motor vehicle traffic and pedestrian circulation along the corridor, particularly in Times and Herald Squares, has been a focus of traffic engineers and planners for decades. 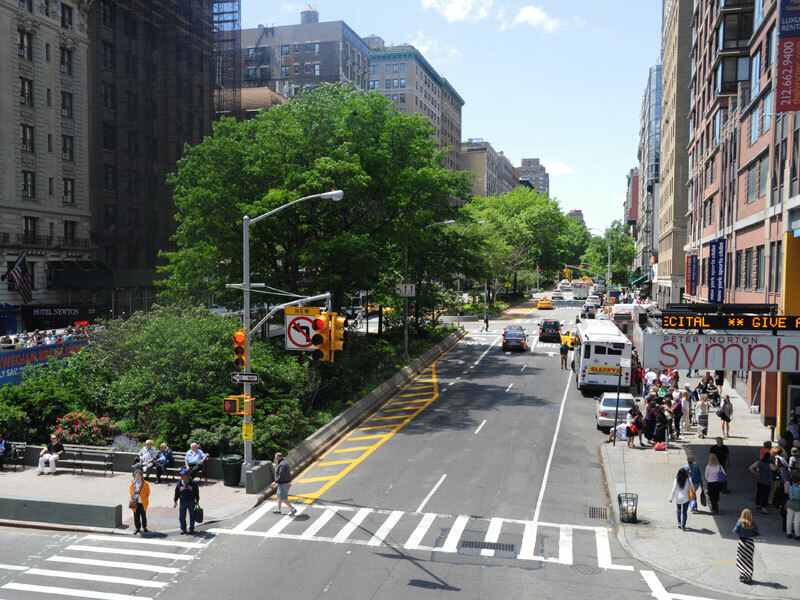 In 2008 and 2009, the New York City Department of Transportation implemented several transformative projects along the Broadway corridor: one in the Madison Square Area between 5th Avenue and E. 23rd Street, the other between W. 47th Street and W. 33rd Street. Each of these projects redirected vehicular traffic patterns on Broadway, in some locations completely closing the roadway to vehicles. Newly created spaces were carved out and converted into pedestrian-only plazas for walkers, cyclists, and passersby lounging in moveable seating. The project was widely successful, not only because of its public space creation but also for safety and mobility enhancements. It has since been made more permanent by expansion throughout other portions of Broadway. 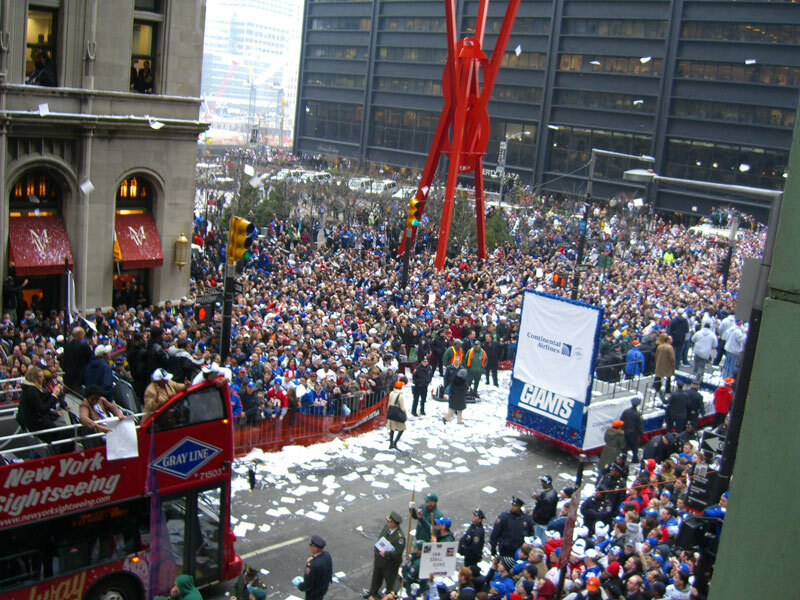 Ticker tape parade for the New York Giants. Photo courtesy Downtown Alliance. Broadway, as it is known today, was completed at the end of the 19th century by joining Broadway, Eastern Post Road, Bloomingdale Road, and Western Boulevard or "The Boulevard"
Grace Church, was designed by architect James Renwick, Jr. (1847); the French Gothic Revival church has been called "one of the city's greatest treasures"
Times Square. Photo courtesy New York City Department of Transportation.